Angelic Home Care, Inc is the perfect solution for North Carolina seniors and others that require assistance in order to remain in their homes, no matter where that home may be located. The Home Care assistance that is needed may be a long term solution or it may be help that is needed for a short term recovery. In either case, Angelic can provide the non-medical assistance needed to allow you or your loved one to remain at home. Our elder clients may need assistance because of normal aging occurrences such as reduced eyesight, arthritis, and diminished mobility. Seniors battling Alzheimer’s or dementia may be in need of special care which we specialize in. Clients recovering from major surgeries may require assistance in bathing, lifting and simple everyday tasks. AHC provides in-home services from 3 hours per day to 24 hours, seven days a week. We can assist our clients with bathing, transportation, meal preparation, linens, laundry, light housekeeping; the sky’s the limit as long as it is non-medical. The care we provide empowers our clients to live well at every stage of life and in every setting, and gives them, their families and their loved ones the support they need to get the most out of life. Our mission is to go above and beyond to make more possible – more joy, more comfort, more security, more quality, more time, more peace of mind. Yet, it’s more than just our work; helping people is our passion. It’s what makes us truly shine – knowing that we’re making a real difference by bringing more to the lives of others every day. We are a licensed agency with the state of North Carolina and are fully insured and bonded. Employees of AHC are protected under workers compensation insurance. We successfully completed Home Care Seminars, Inc. in Raleigh, NC. 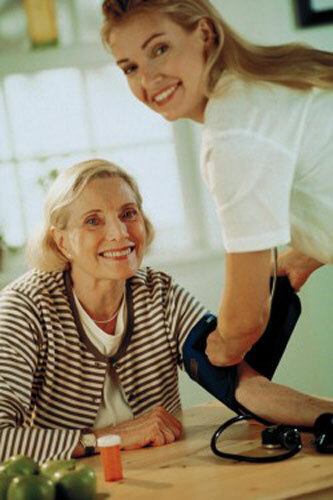 HCS is the nation’s leading training organization for Home Care business start ups. Through this intensive and focused process we learned the in’s and out’s of providing great care to the Elderly utilizing both Companions as well as Certified Nursing Assistants. The training is extensive and covers all state and federal requirements necessary to own and operate a home care agency in the state of North Carolina. Most of all, since we are the owners dealing directly with you, you can be assured of the very best service and care for your loved ones – that’s why our motto … Peace of mind for you and your loved ones. 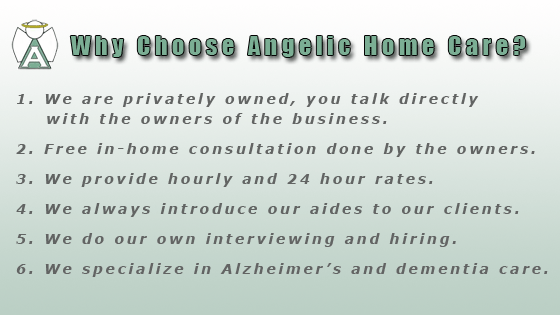 Angelic Home Care call us now for a free, personalized evaluation. I am writing a letter of reference for Angelic Home Care. I hired them when my mother became more confused due to complications of dementia and frailty due to old age. I was very concerned for her well-being while I was away at work, and felt that I needed someone to come in and look after my Mom in my absence. Angelic Home Care was always professional and compassionate in caring for my mother. Monica (her caregiver) was always prompt and courteous. My mother was a difficult client; she never felt as if she needed a caregiver, even though she was not able to take care of herself anymore. Monica never tired in trying to find ways to please my mother and make her happy while she was there. She even studied and read articles at home about dementia to better help my mother with her daily tasks. I highly recommend Angelic Home Care for your loved one’s needs. My mother eventually fell and fractured her pelvis, and is now in an Assisted Living center. However, if she were able to come home, then Monica would still be coming to help her during the day!